ACCUFLUX is the first in-situ real time process monitoring and control system for lyophilization and is the only tool that is a Process Analytical Technique (PAT) allowing monitoring and control of every step in the freezing and primary drying phases of your freeze drying run. ACCUFLUX is designed to obtain a precise direct reading of thermal transfer to the vial. Knowing the energy transfer allows the process to be verified, optimized, repeated and controlled without the use of thermocouples or other invasive measurement techniques. (the speed of heat transfer), has a major impact on ice crystal size, orientation and distribution. The ice crystal structure dramatically influences the drying performance and final product appearance. Measuring the heat flow provides feedback for shelf temperature control during the freezing process to control the crystal structure. ACCUFLUX measurement information is used to produce a cycle optimization design space. 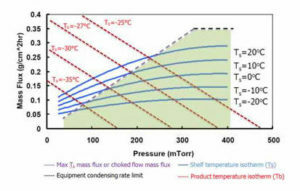 Product temperature isotherms, along with shelf temperature isotherms, can be plotted on a mass flux versus chamber pressure diagram. The resulting information can be used to select the optimum shelf temperature and chamber pressure for highest throughput possible in a specific freeze dryer. This quality by design approach maximizes process and product understanding with a minimum of experimentation. Imagine being able to reproduce the conditions in your production freeze dryer in your laboratory system. Using the AccuFlux measurement, the shelf temperature can be dynamically adjusted to control the energy transfer to simulate your production system, allowing you to produce a protocol that is fully transferrable to production the first time. The Kv is used to verify that there is no material change in heat transfer between batches. The shelf temperature can be adjusted to maintain a constant heat flow. 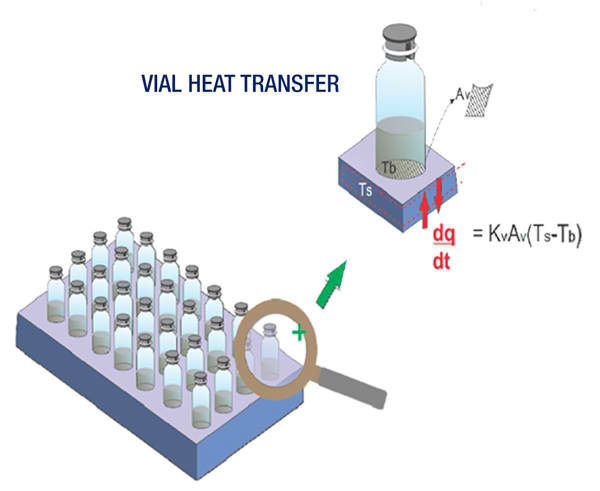 During freezing the heat flux will reach zero when the vial has reached equilibrium. Control the rate of drying by adjusting the shelf temperature to control the heat flux.